Contents: Introduction, Pia F. Cuneo. Part I Defending the Boundaries of Identity: Man’s best friend? 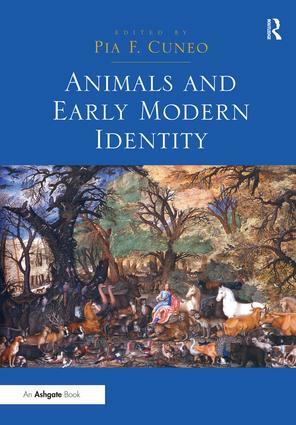 Dogs and pigs in early modern Germany, Alison G. Stewart; Every living beast: collecting animals and art in early modern Munich, Susan Maxwell; Where the sun don’t shine: animals and animality in Louis XIV’s royal labyrinth of Versailles (1668-74), Peter Sahlins; ‘For amusement, merry-making and good company’: horse racing at a German princely court, Miriam Hall Kirch; Breeding nobility: raising horses at early modern German courts, Magdalena Bayreuther; Horses and elite identity in early modern England: the case of Sir Richard Newdigate II of Arbury Hall, Warwickshire (1644-1710), Peter Edwards. Part II Contesting the Boundaries of Identity: Horses as love-objects: shaping social and moral identities in Hans Baldung Griens’ Bewitched Groom (circa 1544) and in 16th-century hippology, Pia F. Cuneo; On the bit: Prince Maurits, Simon Stevin, and the Spanish warhorse, Ingrid Cartwright; The tusked hog: Richard III’s boarish identity, Karen Raber; Who are the animals in the Geese Book?, Corine Schleif; Settler stock: animals and power in the mid-17th-century contact at the Cape, circa 1652-62, Sandra Swart. Part III Transcending the Boundaries of Identity: Individuality and the understanding of animals in the early modern Spanish empire, Abel A. Alves; World of wonders: exotic animals in European imagery, 1515-1650, Larry Silver; French early modern sea-monsters and modern identities, via Bruno Latour, Louisa Mackenzie; Ways of being, ways of knowing: fish, fishing, and forms of identity in 17th-century English culture, Elspeth Graham; Pedagogy and the art of dressage in the Italian Renaissance, Juliana Schiesari; Index. Pia F. Cuneo is Professor of Art History at the University of Arizona, USA. Her current work focuses on sixteenth- and seventeenth-century hippology, and she competes locally in dressage.